Not all ninja books are created equal, trust us. So we've done the leg work for you and rounded up 9 of our favorites, plus some equally awesome ninja crafts. 1. The Boy Who Cried Ninja Tim has a problem, no one believes him, this may be because his version of the truth is more spectacular than his parents can handle. For example, when his mom asks him what happened to the last slice of cake, he tells her the truth, "It was a ninja." The resolution of this truth vs. reality tale is pretty humorous and left all of our little readers smiling. 2. 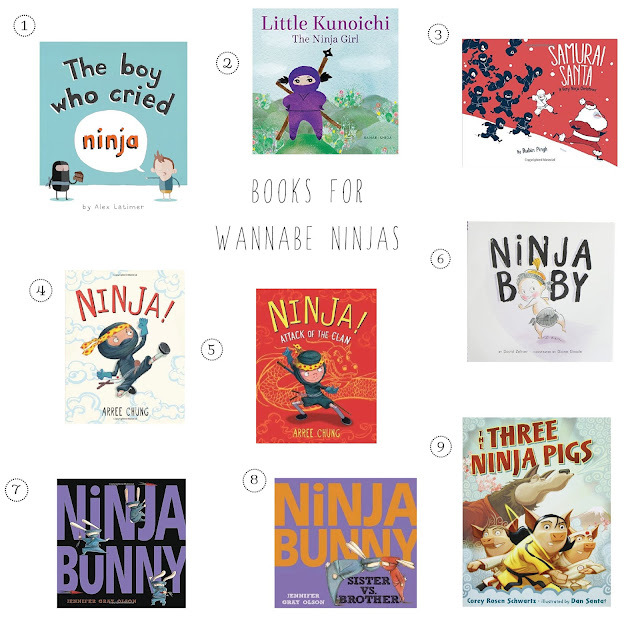 Little Kunoichi The Ninja Girl We love that this book features a girl as a ninja. Little Kunoichi lives on a super secret island and goes to a super secret ninja school where she is not exactly the star student. She befriends a young samurai and together they prepare to dazzle their peers at the Island Festival. The illustrations are beautiful, full of color and whimsy, and oh so lovely to study as you learn what Little Kunoichi has prepared for her impressive festival debut. 3. Samurai Santa: A Very Ninja Christmas If you've been waiting for a book that combines Christmas and ninjas, wait no longer. Samurai Santa is the story of young ninja named Yukio who wants a snowball fight for Christmas and he will stop at nothing to get it. Even if it means scaring away Santa before he gives out all the Christmas presents. 4. Ninja! a picture book for ninja and comic book lovers, yes, you read that right. The comic book styling in this is the perfect back drop for young readers to learn the dos and don't of being a ninja. The text is lively and action packed as Ninja Maxwell uses his stealth skills to acquire his baby sister's milk and cookies. 5. Ninja! Attack of the Clan this follow up to Ninja! was released earlier this year and delves into the sometimes solitary existence of a ninja when looking for a worthy adversary to fight. Ninja Maxwell tries to get all of his family members to play with him but they all have projects of their own they are working on. Maxwell ends up frustrated and decides to meditate but his family has other plans for him. A fun read that explores family dynamics. 6. Ninja Baby It seems like all babies are ninjas in some sense of the word, and Nina, the Ninja Baby is no exception to the rule. We love this and think it would make a great gift for an older sibling expecting a baby because as Nina grows up she receives the gift of a brother, or as she likes to think of him, a kung fu master. A humorous introduction to life with a new baby, ninja style. 7. Ninja Bunny Can you be a ninja and a bunny? And if you happen to be a ninja bunny what rules would you have to live by? We'll be kind and give you Rule No. 1 "A super awesome ninja must always work alone." To find out the rest of the rules, check this one out. You will not be disappointed, unless you hate bunnies or ninjas. 8. Ninja Bunny Sister vs. Brother In this follow up to Ninja Bunny, we follow a more experienced and wise ninja as he tries to retrieve The Golden Carrot of Awesomeness with an unwanted shadow, his little sister. Ninja Bunny has a lesson to learn and it is that sometimes big doesn't always mean better. 9. The Three Ninja Pigs This is first in a series of books that take fairy tales and twist them to appeal to the ninja lover. In this rendition, the three little pigs are all in various forms of martial arts training so that they can defeat the wolf, with pigs one and two being a little less diligent about their studies than pig three. Told in rhyme with the illustrations by Dan Santat, this is sure to delight. We think it's nice to have the option to supplement books with crafts so here are a few that we have on our 'to make' list.